Aspyr Media and Bloober Team's cyberpunk horror game. 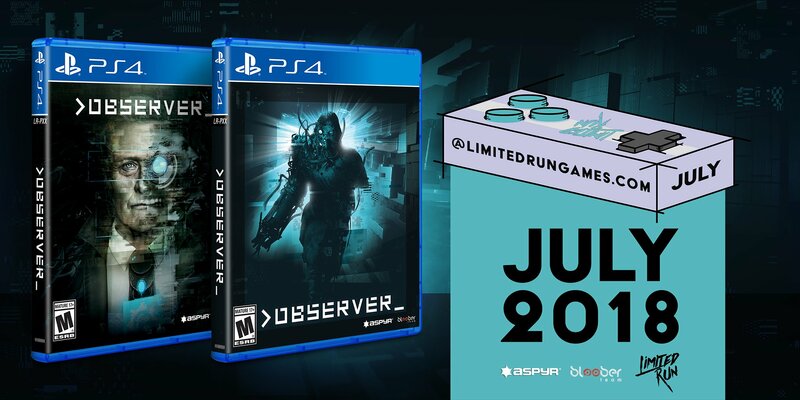 Limited Run Games will release a limited run physical edition of Aspyr Media and Bloober Team’s cyberpunk horror game Observer for PlayStation 4 via the Limited Run Games online store in July, the company announced during its E3 2018 press conference. Krakow, the Fifth Polish Republic. The year is 2084. If you somehow survived the Nanophage, odds are you were killed in the War. Those who live have turned to drugs, VR, neural implants — anything to distract themselves from this new reality. You are Daniel Lazarski, an elite neural detective known as an Observer, and part of a corporate-funded police unit whose purpose is to hack and invade suspects’ minds. In this future, anything you think, feel, or remember can be used against you in a court of law. >observer_ is a first-person psychological horror game that focuses on a dark, dystopian setting and deep, character-driven storytelling. Developed by Bloober Team, the creators of Layers of Fear, >observer_ is a horror experience meant for mature audiences. What you see will disturb you. The Future of Fear – Discover a dark cyberpunk world beset by plagues, war and squalor. Play as the new front line of neural police as you hack into the jagged minds of the insane. Interactive Insanity – Designed to disturb, >observer_ is a psychologically twisted, interactive horror experience that will leave you questioning your reality as well as your very sanity. Starring science-fiction legend Rutger Hauer – The strange mind of Daniel Lazarski is brought to life by Hollywood great Rutger Hauer (Blade Runner). Encouraged to improvise and make the character his own, Hauer’s performance raises the standard for acting in a game.